You can upload existing recipient data into our system. Before you do this please carefully read our Anti-Spam Requirements. Please note the imported data has to be verified by CleverReach first. First, create the respective recipient list in your account. Under [Recipients] you can manage your lists and create new ones. Basically, all new lists only contain the fieldEmail at first. Naturally, you can add further fields for your list if needed. For further information click here. After having selected an option, you can now allocate data fields. 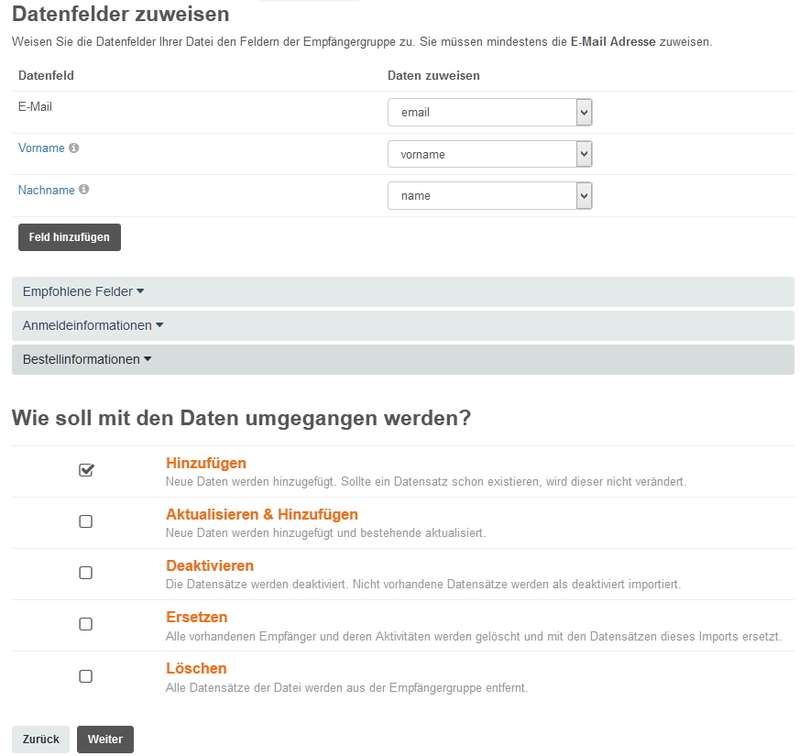 On this page you decide how the data from your import file is matched with the database fields in the CleverReach list. On the left side you will find all available fields for your list and on the right side you can select the column headers from your import file. In any case, you need to import the email address, all other data (e.g. first and last name) is optional. If there aren't any fields displayed on the left, you will have to create them first (find further information here). On the left, you can see the data fields of the recipient list. In the Drop Down Menu, you select the data to be allocated to the respective data field. If your file contains no data for a certain field you can insert an alternate value that then will be added for every recipient. Import further data via the sections [Registration Details] or [Order Details]. For example, under Registration details, you can import your own date entries, such as your own registration or activation data. If you don’t make a selection (recommended) the date of import will be added. If you import your own dates, please be carefule to import the registration and the activation date, as otherwise recipients are imported as inactive. If the date field is not displayed your import file probably only contains the field email and this step is simply skipped. New data is added. If a data set already exists, it is not changed. New data is added, already existing data is updated. Inactive (meanwhile unsubscribed) recipients remain inactive. However, doubles are filtered, an already existing data set is updated with the first data set found, further doubles are ignored. The data sets are deactivated. Non-existent data sets are imported as inactive recipients. All existing data sets are deleted completely at first and all data sets of the new list are added. Please note, that all details (clicks / opens / unsubscribes) of all recipients get lost in this step. All data sets of the import file are removed from the recipient list. All details from your import file get lost, i.e. details such as opens, clicks, unsubscribes and more. If the features [Replacec], [Delete] and [Deactivate] are not available, your list is protected. Go to the list and click on [Settings] > [General] to deactivate delete protection. 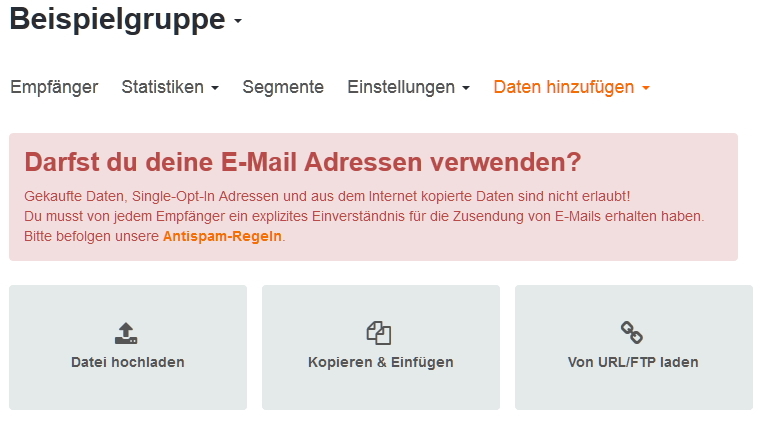 For safety reasons, the feature Replace, Delete and Deactivate are not available, if a mailing has been sent to this list within the past 3 days. If special characters are not imported correctly there is probably an encoding issue with your import file. Make sure that the file is UTF-8 encoded (CSV- and TXT format). Before an import is started your list will always be protected automatically if you do not turn Delete protection off (find further information here).